Lymphoma is the third most common malignancy in children (0–14 years) and the most common malignancy in adolescents (15–19 years). 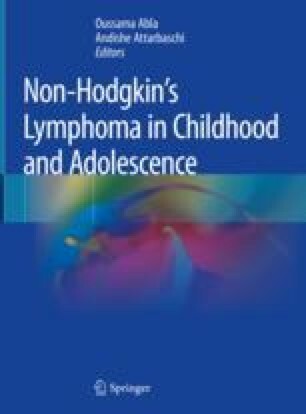 Non-Hodgkin lymphoma (NHL) encompasses a diverse group of lymphoid neoplasms cumulatively accounting for 7% of all malignancies under the age of 19 years. Childhood NHLs are distinct from the adult counterpart and are mainly high-grade neoplasms. Across all histology and age groups males have a higher incidence of NHL as compared to females. Incidence of NHL is 10–15 per million under age of 19 years in most developed countries; however there is significant geographical variation with an incidence as high as 30–60 per million mainly attributable to higher endemic Burkitt’s lymphoma in equatorial Africa where there is close association with Epstein–Barr virus and malaria. NHL is rare in infancy following which its incidence steadily keeps increasing. The histologies contributing to the increasing incidence change from BL in childhood to DLBCL and ALCL in adolescents. As with most childhood cancer incidence of NHL is higher in whites as compared to African Americans. Incidence of childhood NHL has increased over last four decades with an annual percentage change of nearly 1% in North American and European registries. Therapy of childhood NHL has mimicked the success of childhood leukemias with 74% decrease in mortality and doubling of survival rates from 45% to 90% in a span of four decades in high-income countries (HICs). However, as with the incidence, there is big disparity in outcomes of NHL with poor survival rates between 20% and 50% in low- and middle-income countries (LMICs). Ironically LMICs account for >80% of the global pediatric cancer burden thereby neutralizing the success achieved in HICs when seen at a global level.